Given the number of options in rated wood panel siding, information in an order must be precise. Here is how to interpret what wood panel grade stamp means to insure you receive the correct product. Many of us go through our careers installing whatever the general contractor has delivered, and we never have a problem. But the one time a forklift driver grabs the wrong bundle, it gets delivered and you unknowingly install it, everything can change. Suddenly, you have a big problem. That’s when you’ll be held to the highest standard of professionalism, which means you should have known it was the wrong material. Now you’ve spent a day installing plywood that you’re going to have to pay for, rip off and replace. That’s why it’s worth knowing what that wood panel siding grade stamp means. APA – This is the official APA logo. It signifies that the manufacturer is a member of APA, and the panel has been manufactured and tested in accordance with APA standards. 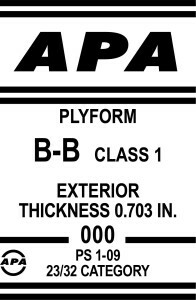 Representing more than 80 percent of structural wood panel producers in the United States, APA is the leading grading organization for the industry. It develops standards for manufacture and testing of wood panels, including specifications identifying acceptable wood species, veneer quality, type of adhesives, amount of pressure that must be applied during forming, and temperature at which the adhesives must be set. Their trademark grade stamp identifies each panel, lists its specifications and intended use. RATED SIDING – APA Rated Siding products include plywood, over laid oriented strand board (OSB) and composite materials. They are available as panels or lap siding. 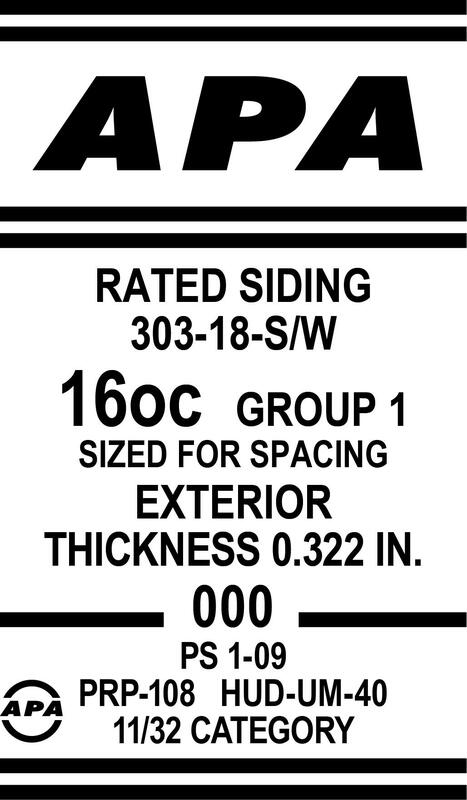 303-18-S/W – The 303 designation indicates the product is plywood. APA 303 siding can be manufactured in 13 different face grades, and in a variety of textures and groove patterns. Common products are Rough Sawn and Texture 1-11. 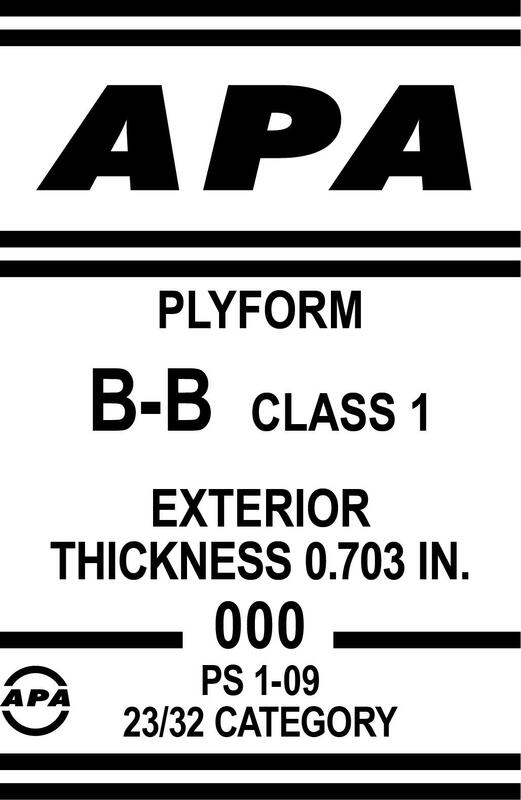 APA 303 siding includes four appearance classifications: 303, 303-6, 303-18 and 303-30. The number 303 followed by a dash and second number indicates the maximum number of patches allowed on a 4×8-foot sheet. The highest quality grade is 303. This panel must be clear and free of natural defects. A 303-6 panel is allowed up to 6 patches, 303-18 can have 18, and a 303-30 panel can have 19 to 30 patches. The letters S and W identify the type of patch material used. W indicates the panel has wood patches. S signifies patches are synthetic materials. A panel marked S/W may contain patches of either wood or synthetic materials. 16OC GROUP 1 SIZED FOR SPACING – The 16OC notation indicates this siding can be applied over supports at 16 inches OC without additional support. It can be applied directly to wall studs or over non-structural sheathing. When applied over non-structural sheathing, the lateral/shear support requirements of the structure must be met, either by the rated siding or by another bracing system. 4×8-foot rated siding is designed to be installed with its long dimension parallel to supports. Groups are a strength rating system for plywood based on the species of wood it’s made from. Plywood can be manufactured from more than 70 species of wood under PS 1-95 guidelines. The various species are divided into five groups according to their structural characteristics. The lower the group number, the higher the strength of the panel. Group 1 is the strongest. If a panel is formed with a different species of wood veneer on each face, the panel will be grouped to the higher (weaker) group number. EXTERIOR – This is the durability rating. Exterior means the panel is formed using a fully waterproof adhesive and is designed for permanent exposure to weather and moisture. Although Exterior panels are rated for exposure, they must still be properly finished with paint or stain. All edges should be pre-sealed before installation to prevent moisture absorption. THICKNESS 0.322 IN – This is the thickness label. It gives the panel thickness in thousandths of an inch. 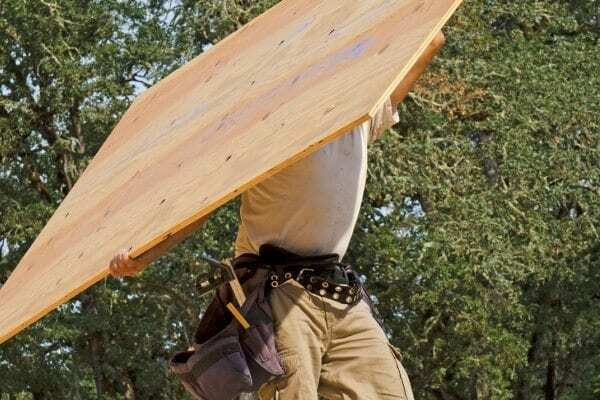 Because of varying regulations by the agencies with authority over the manufacture of wood-based panels – the U.S. Department of Commerce and the National Institute of Standards and Technology (NIST) – two statements of thickness are required in order to meet legal requirements. 000 – Mill identification number. Every APA member mill is issued a three digit ID number. If you have a problem with a batch of panels (rare, but it happens), this number can be used to trace the panels back to the mill where they were produced. PS 1-09 – Refers to Voluntary Product Standard PS 1-09 – Structural Plywood. Adopted by APA on May 1, 2010, the standard was developed under Commerce Department procedures. It provides definitions for the types and grades of structural panels and lays out specific requirements for acceptable wood species and adhesives, veneer grading, panel construction, dimension tolerances and moisture content. PRP-108 –APA PRP-108 – Quality Assurance Policies for Structural-Use Panels – requires the mill to submit to an on-site inspection program. APA issues daily test reports and weekly audits to verify the mill’s products are in compliance with the quality standard. In addition, the mill must agree to employ an APA Quality Management System and certify mill staff through APA’s Certified Quality Technician program. HUD-UM-40 – The product meets HUD Building Product Standards. 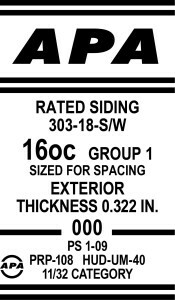 11/32 CATEGORY – It gives the panel thickness in fractions of an inch – as discussed above – because two statements of thickness are required. This is the dimension that you’ll find listed in the International Building Code (IBC), International Residential Building Code (IRC), on plan drawings and in construction specifications. Given the number of available options in rated wood panel siding, information in an order must be precise to insure you receive the correct product. Here’s an example of a siding order: 19/32-inch, 4×8, Rated Siding, 303, 16OC, 6-S/W, Texture 1-11, groves 4-inches OC, 100 pieces. Anyone who builds concrete forms should be familiar with this grade stamp. Here’s what it means. PLYFORM – All exterior rated structural panels are made using moisture-resistant adhesives, so any of them can be used for concrete formwork, but Plyform is a structural panel specially designed for multiple re-use as form material. B-B – Both faces of this panel are made from B grade veneers. Next is Grade A. This veneer is smooth and paintable with no more than 18 “neatly made repairs per sheet.” N and A grades are high-quality plywood that you can use to build cabinets or doors. Our panel is B grade. This is a solid surface veneer. It can have tight knots and repairs, but is smooth to the touch. When coated with form oil, this smooth surface helps keep concrete from sticking to the form. Grade C is the lowest quality veneer grade used in Plyform panels. C grade has tight knots up to 1½-inches across and can be patched with natural or synthetic materials. The lowest plywood grade, D, can have 2½-inch knots and is limited to Exposure 1 and interior use. CLASS 1 – Plyform is manufactured in three classes: Plyform Class I, Structural I Plyform and Plyform Class II. Plyform Class I has Group 1 faces on both sides. Structural I Plyform is manufactured with Group 1 veneers throughout for maximum strength and durability for extended re-use. Plyform Class II can have Group 2 or 3 faces, but is still rigid enough for most forming applications. EXTERIOR – See definition above. THICKNESS 0.703 IN – See definition above. 000 – Mill ID number. See definition above. PS 1-09 – Voluntary Product Standard. See definition above. 23/32 CATEGORY – Performance Category. See definition above. To order this material, request 23/32-inch, Plyform, 4×8, B-B, Class I, 100 sheets. As you can see, ordering wood-based panels can be complicated. Nothing beats having a good working relationship with your supplier. Take a moment to tell your rep what you’re using the material for. If you miss something in your order, your supplier should be able to help you catch the error. More than 4,000 years ago someone figured out if you glued several thin pieces of wood together, you could create one piece that was stronger than the sum of its parts. The first patents for panels made from laminated wood veneer were issued in 1865, but a product we’d recognize as modern plywood didn’t come about until years later. In 1905, Portland, Oregon, hosted the World’s Fair. Businesses were encouraged to produce exhibits showcasing their latest technological advances. The Portland Manufacturing Co. chose to show off its new product: 3-ply Veneer Work. They cut three thin sheets of wood veneer, laid them with the grain of the two outer veneers running the long dimension of the sheet, and the center veneer running the short dimension. They spread glue on the veneers with paint brushes and dried them under pressure using house jacks. The 3-ply Veneer Work exhibit was a huge success, attracting the interest of door and cabinet manufacturers. Orders poured in, and by 1907 with the aid of an automatic glue spreader and hand presses, Portland Manufacturing was producing more than 400 panels of 3-ply veneer per day. In the years that followed, technology used to manufacture multi-ply veneer panels advanced. Stronger adhesives and machines that could produce more-consistent veneers enabled manufacturers to create a wide variety of laminated wood panel products. The product became a major U.S. industry with several large manufacturers producing plywood for various applications. As the industry matured, it became apparent that standards were needed to insure consistency and quality. Centered in the Pacific Northwest, plywood manufacturing’s veneer of choice was Douglas Fir. In 1933, a group of manufacturers joined together and formed the Douglas Fir Plywood Association. As demand grew, other species of lumber were used and manufacturing spread across the country. Mills in the southern United States began producing large quantities of southern yellow pine plywood. In 1965, the name was changed to the American Plywood Association (APA).